Help files - in English! Chrome OS offers several Chinese input methods - Pinyin, Wubi, Zhuyin, Cangjie, Quick, Array, and Dayi - and a few basic Chinese fonts. Those input methods are based on the Chrome extension project that is developing the cloud-based Input Tools for Google Docs and other Drive apps. These replaced the standard Linux Ibus input methods like Chewing that were in Chromium and Chrome OS for the first couple of years. 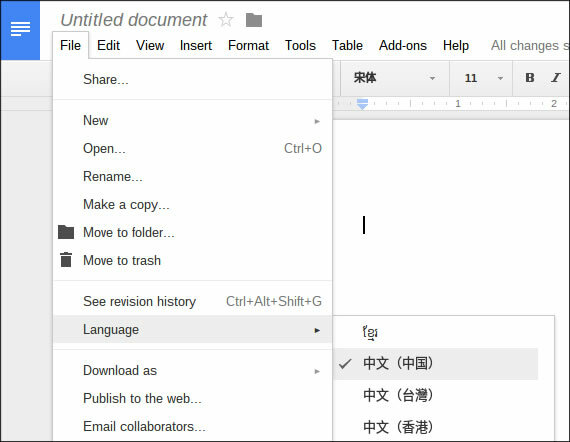 The Chrome OS support site offers brief instructions for setting up your input methods and language display (you'll find that here ) but I thought it might be useful to post screen shots and guide you through this step-by-step, and explain a little about Chinese fonts and input methods in Google Docs as well. The Chome browser will open to a Settings page. 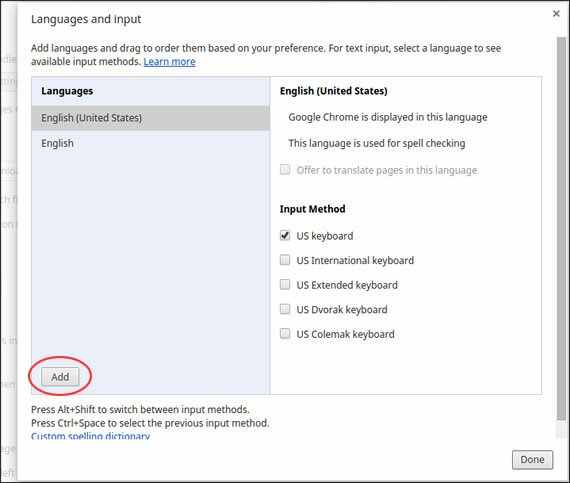 Scroll down, and at the bottom of the page click "Show advanced settings..."
Then scroll down to "Languages", and click the "Langauges and input..." button. You'll be rewarded with a language list, from which you can select Simplified and/or Traditional Chinese, or the general "Chinese" locale. 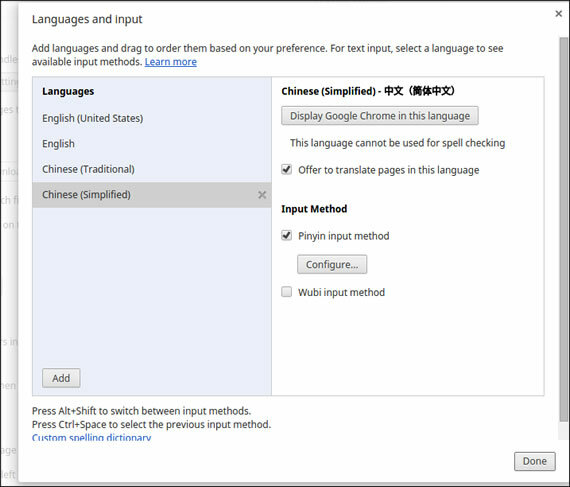 As of this writing, the only differences between these three are in display language: "Chinese (Simplified)" and "Chinese (Traditional)" offer a button that says "Display Google Chrome in this Language" and of course their portions of the input methods, while "Chinese" includes all Simplified and Traditional input methods	but no display language feature. 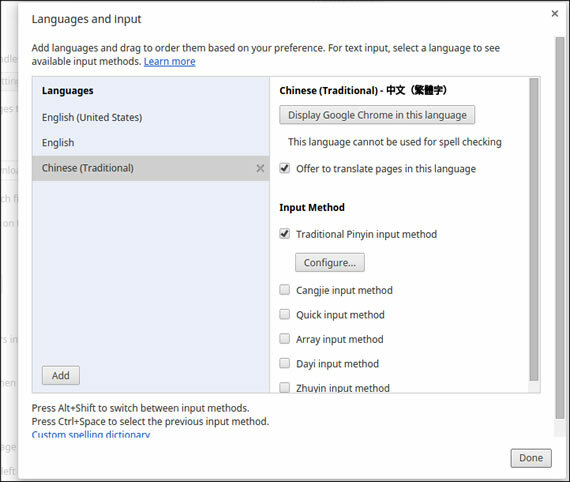 Traditional Chinese input methods in Chrome OS include Pinyin and Zhuyin, which unfortunately don't add up to all the features of the Chewing IBus IME they replaced. For example, you cannot narrow the candidate list by typing a tone number, and must resort to typing phrases that contain the character you want even if you then delete unwanted characters. Before more of you ask, I'll add that - as far as I know - Chewing has not been ported to the Extension IME framework, so it cannot be added to Chrome OS at this time. Your only option would be to manually install an earlier version of Chrome OS, which I have not tried to do. In the current release, as you select each input method you will be offered a "Configure..." button leading to a few options like fuzzy Pinyin, but no tone number input. The Simplified Chinese input methods are Hanyu Pinyin and Wubi Zixing, and as you select them you will be offered a "Configure..." button that offers options like fuzzy Pinyin. This Pinyin input method does not support Traditional characters, for which you must switch to the Traditional Pinyin input selected under "Chinese (Traditional)" above. 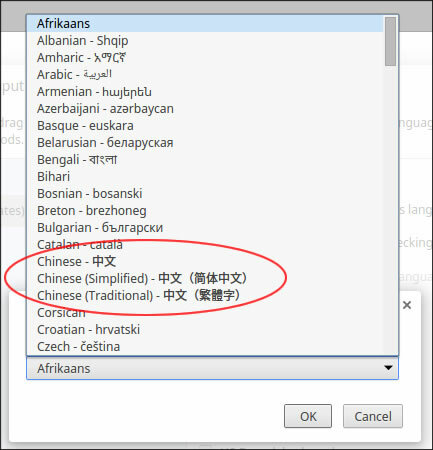 The Ibus-based Pinyin input included with earlier versions of Chrome did include both types of characters. I assume this is because in the Web world everything is UTF-8 and Unicode, so there is no need to offer Traditional characters in both GB code and Big5 IMEs or code-page simulations thereof. Now you can type Chinese! The current input method will be displayed at the lower right of the screen, next to your account icon. Unfortunately at this time both versions of Pinyin are indicated by the same "pin" (拼) icon, so to be certain you're on the right one you have to just start typing or click the icon to open the system menu. 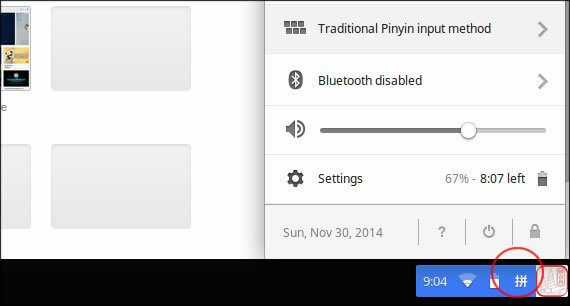 In this example, "Traditional Pinyin input method" is listed at the top. Press <alt-shift> to cycle through all input methods, or <ctrl-space> to switch between the last two input methods used. Options like full- and half-width punctuation are available in the system menu by clicking on the input method name, along with another way to switch between languages and a way back to input method setup via an option to "Customize languages and input..." at the bottom of that submenu. Google Docs offers online versions of these input methods, and yet another way to change langauges and their options within the brower if you wish. The best thing about that is that Docs offers a floating language panel with half/full width and punctuation buttons, just like Linux Ibus. Other Google Drive appls, like Sheets, depend on your OS-based input methods at this time. Following is a little more about what you'll find there. 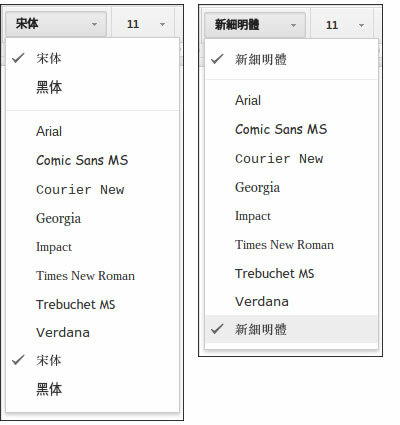 Chinese fonts on the web are normally limited to a few basic choices that any PC is likely to be able to supply to a browser from the user's side, and Google Docs	is no exception. Many Traditional character web sites specify Song (宋體) fonts, also known as Ming (明體) fonts, often using the name of a Microsoft font like PMingLiu (新細明體). Non- Microsoft versons simply fall back to whatever your system supports. Simplified character websites also rely mosly on the Song (宋体) font, for which browsers then call Microsoft SimSun or equivalent. Google Docs also offers the common san serif Hei (黑体) font. Although more elaborate typefaces can be served up as "web fonts" (that is, delivered to web pages via the Internet from font servers), the fonts listed in the Docs menu - or their equivalent fallback fonts - are also available on most systems even when offline or when they are for whatever reason experiencing difficulty accessing a font server. This is only a partial workaround. When I send test messages to users of webmail services or Microsoft Outlook, the Song and Ming fonts display OK. But on Android devices, it changes back to Hei! Not sure what happens on iPhones. This is very frustrating, and I hope to see this fixed someday. Meanwhile I'm not going to use this, so please let me know if this workaround is no longer necessary. I have a more detailed article about Chinese fonts on the web here if you're interested. And how did I take screen shots on a Chromebook? I made these screen shots by pressing <ctrl> and the "page flipper" button on a Chromebook keyboard. To make partial screen shots, press <ctrl-shift> and that button. To find the saved images, go to Apps and cick the "Files" icon. You'll find your screen shots in the Downloads folder. From there you can copy them over Drive or a USB stick by dragging-and-dropping. Copyright © 2005 PinyinJoe.com. All Rights Reserved. "Microsoft", "Windows", "Linux", "Apple", "Google", "Android" and any other trademarks on this site are the sole property of their respective owners.